Several fascinating horse-related objects are among a treasure trove of 10,000 Roman objects unearthed during an archaeological dig in London. Archaeologists have been poring over the three-acre central London site before a new building is erected. Their finds include a padded and stitched piece of leather with an image of a gladiator fighting mythical animals. The leather has been elaborately worked by its creator. Archaeologists say it is one of the most puzzling finds at the site to date. They suspect it may have come from a chariot, but can only guess because nothing similar has ever been found. Another remarkable find is a set of clappers, designed to make a jingling noise when the horse moves. 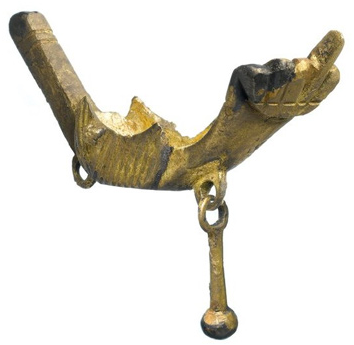 A horse harness ornament was also unearthed, resplendent with two lucky symbols – a fist and a phallus. Researchers from the Museum of London Archeology were appointed to excavate the site, which sits in what was the heart of the Roman City of London. It had many years ago been identified as the home to the Temple of Mithras. It was clear that the potential for archaeology was immense. Six months later, the team has excavated seven metres of archaeology, removed 3500 tonnes of soil and revealed some 10,000 finds covering the entire period of the Roman occupation of Britain, from the 40s AD to the early 5th century. Situated on the largest swathe of the lost Walbrook River still remaining in the City of London, the wet conditions have created perfect conditions for the survival of archaeological material. This includes objects and structures made of wood and leather, which rarely stand the test of time, leading archaeologists to dub it “the Pompeii of the north”. The result is an extraordinary glimpse into life in bustling Roman Londinium. Wooden buildings that survive to shoulder height speak of thriving industry. The archaeologists even discovered a rare inked writing tablet revealing an affectionate letter. A complete and exceptionally beautiful amber Gladiator amulet. The largest assemblage of fist and phallus good luck charms from one site. A previously unexcavated section of the Temple of Mithras. Rubbish and ritual deposits from the Walbrook river, including Roman coins. A Roman well into which a pewter hoard, coins and cow skulls were thrown as part of a ritual. Museum spokeswoman Sophie Jackson, said: “The site is a wonderful slice through the first four centuries of London’s existence. First excavated in 1954 by eminent archaeologist W.F. Grimes, the discovery of the Temple of Mithras was perhaps the most famous excavation of the 20th century, with hundreds of thousands of people flocking to see the work unfold on site. The current excavations started with the careful dismantling of the 1960s reconstruction of the Temple, and the current excavation has touched on previously unexcavated remains. On completion of the work, the temple and finds from the current excavation will become part of a publicly accessible exhibition within Bloomberg’s European headquarters, which is to be built on the site.